The country star had just started singing her hit The House That Built Me at the Xfinity Center when she spotted Jeff Tudisca's handmade sign in the crowd and had to stop the show. The U.S. serviceman's placard read: "3 combat tours. (Your) voice was the last thing I listened to EVERY NIGHT! THANK YOU!!!" Many fans assumed the soldier was invited backstage to meet Miranda after the show, but when a local radio DJ discovered that didn't happen, he decided to set up a meet-and-greet between the pair. It will take place on Friday night (26Aug16), before Lambert's show at Gillette Stadium in New England. In an interview with Broadway’s Electric Barnyard, Tudisca admitted he's very excited to meet the country music superstar, but he's not quite sure what he'll say to her. He also lost it during his emotional connection with Miranda at the Xfinity Center. In footage from last week's gig, the singer took Tudisca's powerful sign and propped it up near her microphone stand while attempting to finish The House That Built Me. She eventually gave up and told fans, "I gotta get a drink. Y'all, I gotta do it!" She then asked fans to take over and complete the song for her. Her emotions were also tested the following night in East Rutherford, New Jersey when a cute six-year-old fan named Sebastian asked Miranda to marry him. "I got engaged today!" Miranda, 32, told the audience at the MetLife Stadium, where she was opening for Kenny Chesney. "There’s a little six-year-old boy here named Sebastian. He asked me to marry him. I said yes - in 25 years." The singer then showed off a pink ring on her finger, adding, "Look at this beautiful ring! He got on one knee. He was such a gentleman. It may be my favourite proposal ever." Florence Welch's homesickness song to feature in Tim Burton film. 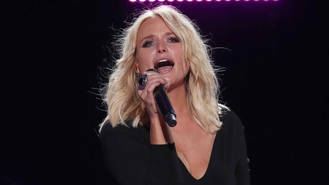 Singer Miranda Lambert is set to meet the soldier who brought her to tears at a concert in Connecticut last week. Jennifer Lopez is piling on the work following her latest love split by developing a new TV legal drama. Michael Buble has serious pop power on his new album thanks to a track co-written by Harry Styles and Meghan Trainor. Lady Leshurr doesn't feel the need to rap about violence despite being influenced by Eminem. Foxes' next album will be "uplifting" and "personal". Superstar Jennifer Lopez has reportedly split from her on/off boyfriend Casper Smart. Michael Jackson used to insist on taking his pet snake to the recording studio, much to the unhappiness of producer Quincy Jones. Kings of Leon's new album will be full of "personal stories". Perrie Edwards has a new love interest, but has already embarrassed herself in front of him by misreading one of his text message.